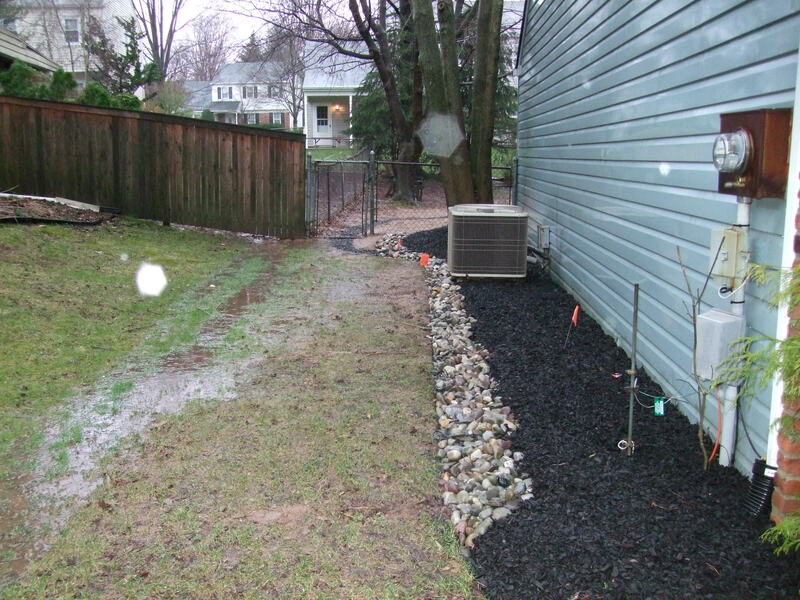 A Doylestown homeowner reached out to Nickett Landscaping to help rectify a major water issue at their home. Senior designer, Chris, spoke with the homeowner during the initial call in order to gather some preliminary information on their overall concerns, the longevity, severity and any recent home and landscape changes that may have taken place over the past several months. 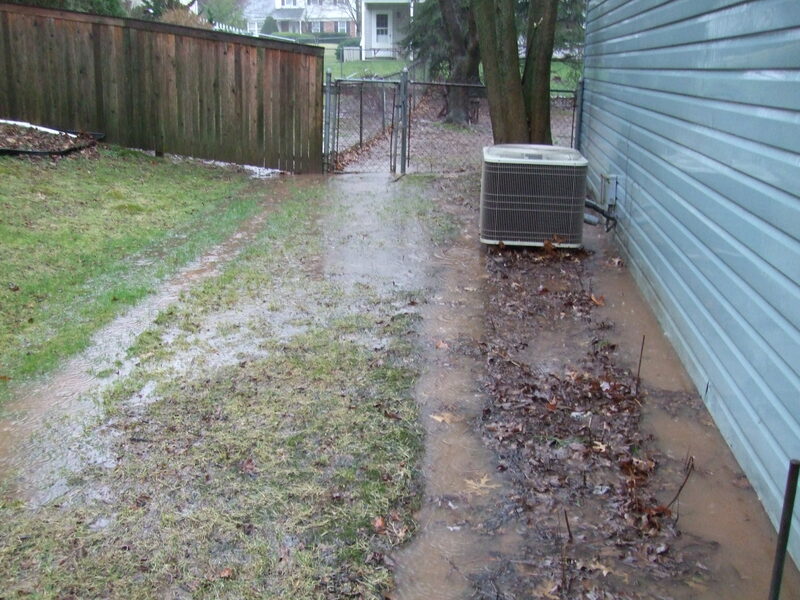 The homeowner informed Chris that nothing had recently changed with their landscape or home but the water flow was getting greater each year. 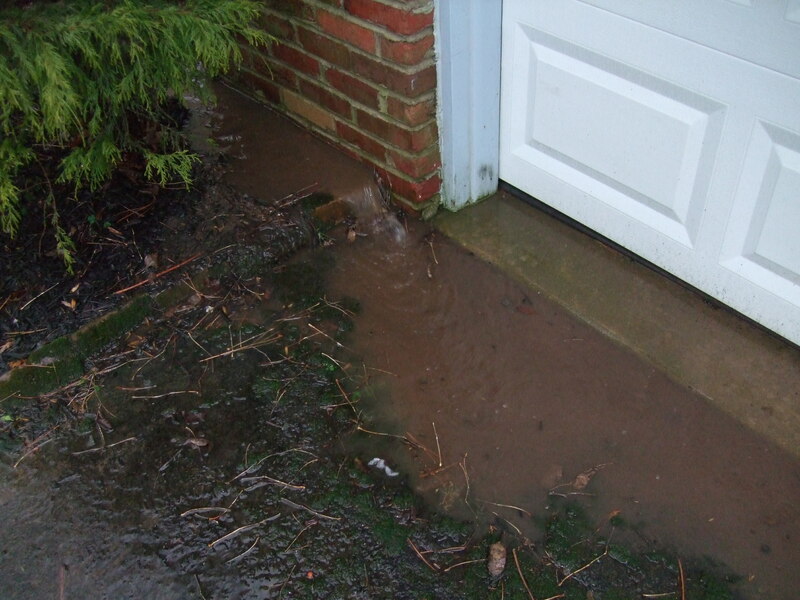 Their final breaking point was when the water flow had finally penetrated the interior of the home. Chris set up an appointment to meet with the homeowner during a rainstorm so they could look at the problem first hand together. During the appointment Chris observed that the homeowner was the last home at the bottom of a roadside hill. Chris walked up the road to see that all of the homes above and their water discharge were compounding the situation. The water flow was strong. Strong enough to move a large amount of 3”-5” rocks from the side of the house, 20-30 feet away down into the street. 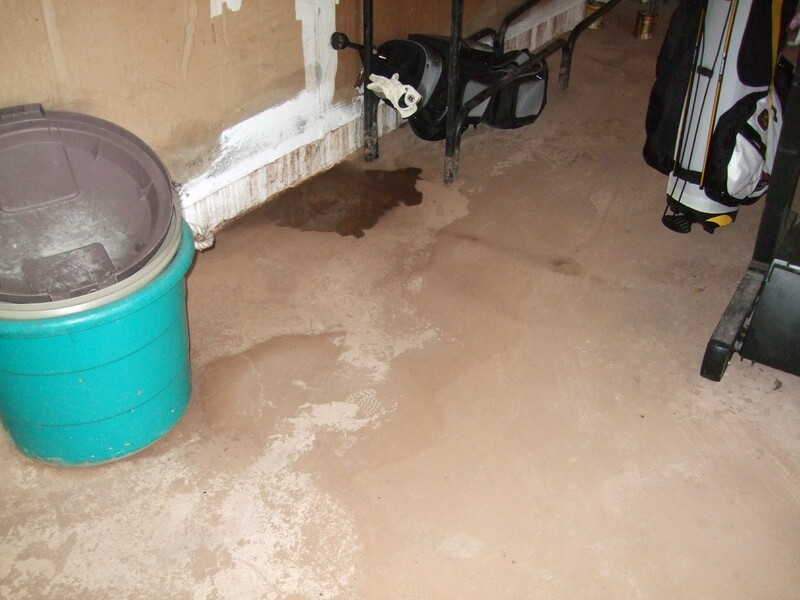 Chris also noticed there was negative grade along the foundation allowing for the pooling water to get directly under the siding and flow directly into the garage. 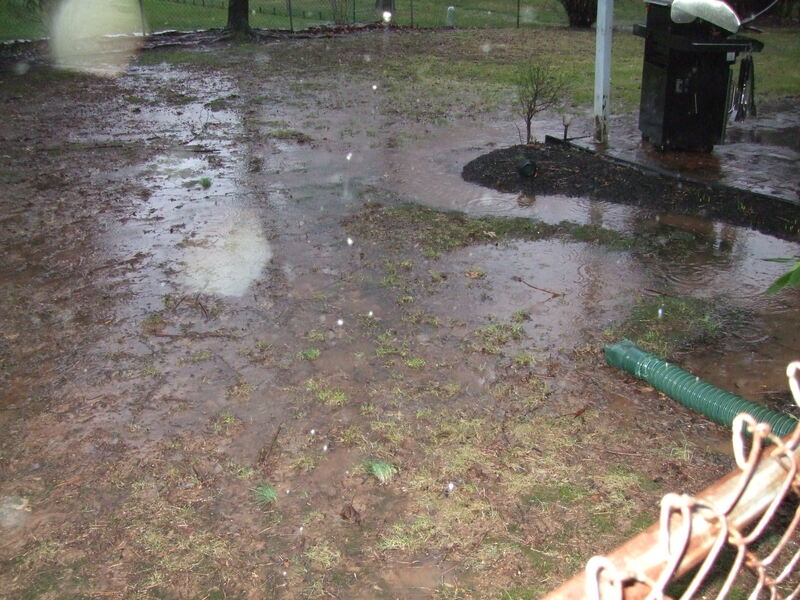 The homeowner also informed us that the lawn would sometimes take weeks to dry out after heavy rains. 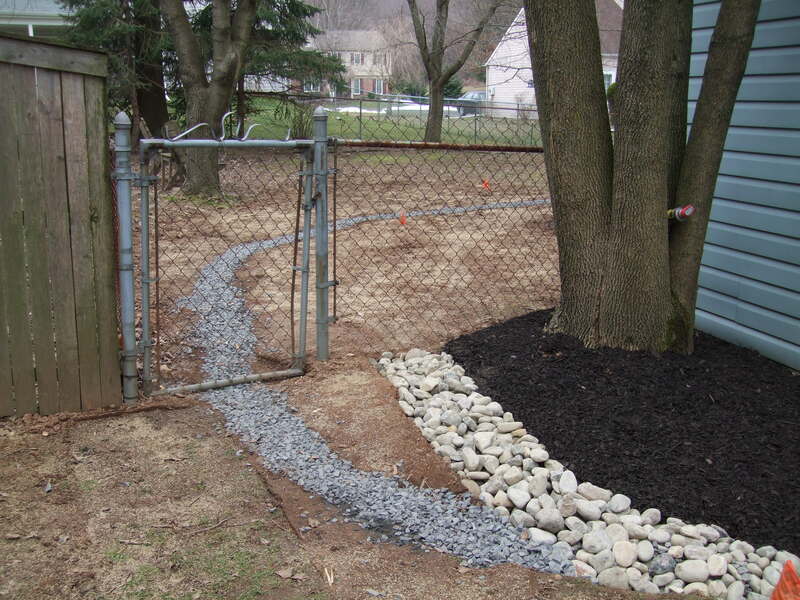 The next door neighbor was not willing to allow a system put on the property line where the water swale first collected the water, so a more aggressive approach was needed. 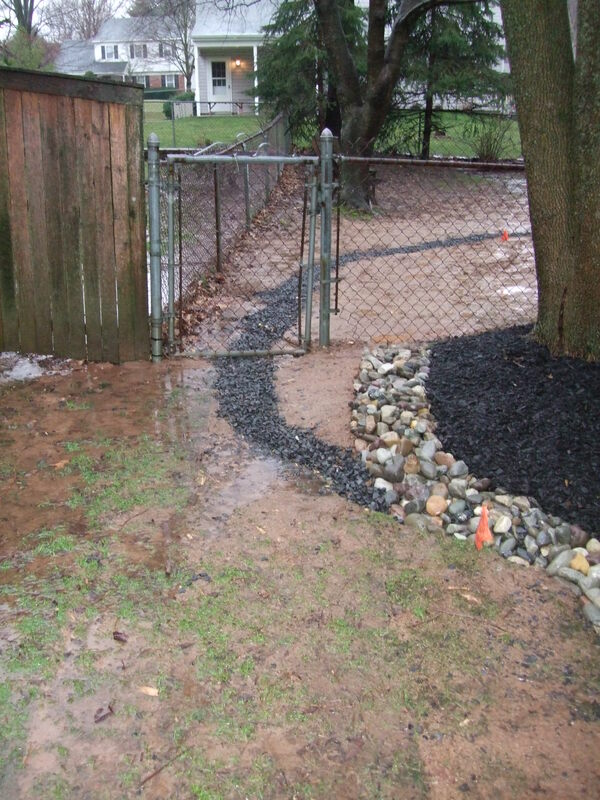 This drainage design required a special, Nickett Landscaping designed underground drain pipe, which could handle the tremendous water flow. 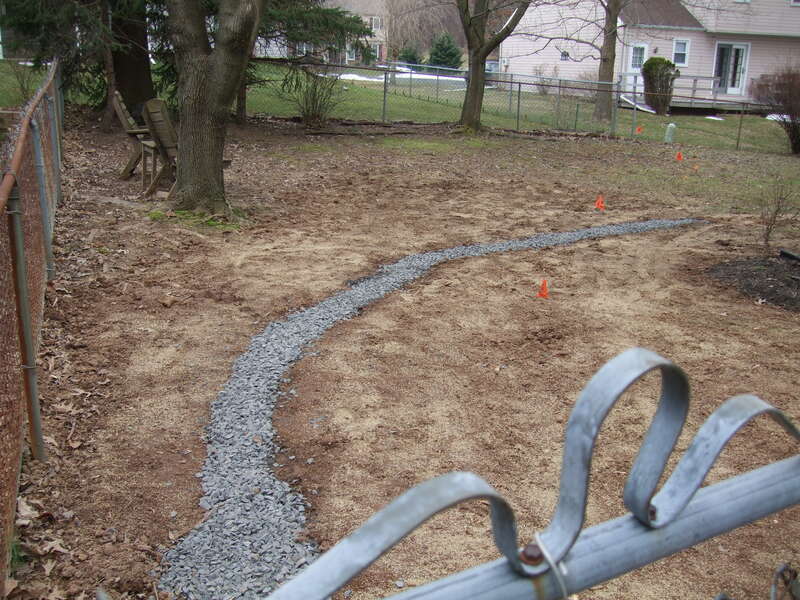 Re-grading of the foundation bed was also necessary to keep the water away from the home and directed to the new underground drainage system. Also because of the heavy flow, the system needed to split the collected water to the front as well as the back of the property. Approximately 200 feet of pipe was needed. Two downspouts from upper and lower gutters were also incorporated into the design as they were exacerbating the water flow into the garage. There was no permit needed per the township as all of the water was being redirected from the home and staying on the property. 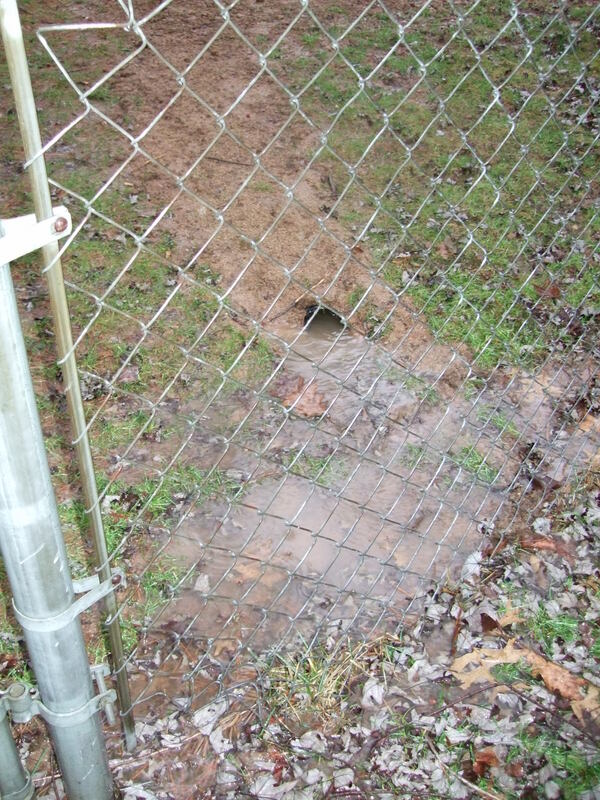 The captured water was to be redistributed to natural areas toward the edge of the property. On a drier day, after the utilities were all marked, the crew and Chris laid out the underground design. Plywood was laid as to prevent any further damage to the existing lawn. 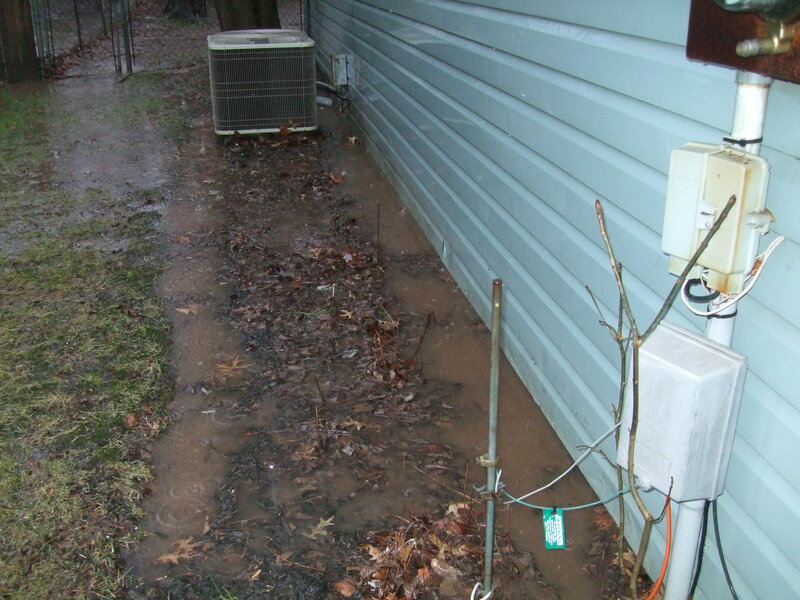 The air conditioner was slightly elevated to allow for the new topsoil so the negative grade could be corrected. The underground system was laid out, properly pitched and installed. Crushed stone was added to the drainage inlet pipes to allow for maximum inflow as well as providing a protective filter. 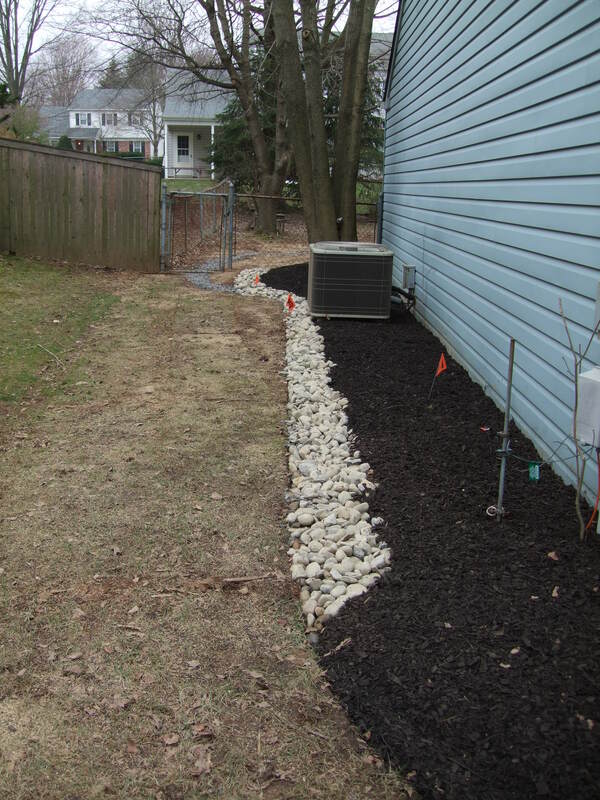 Decorative river stone was added to the bed edge over the drainage inlet pipe and the foundation bed was mulched for a nice finished look. Lastly the lawn was reseeded. The next heavy rain came in the midnight hours. The homeowner had left an excited message overnight stating that the system was working the way they were told it would. They were shocked, as they always felt there was no way to correct her water nightmare. Chris went out that same rainy day to meet with the homeowner to see all was working as was desired. 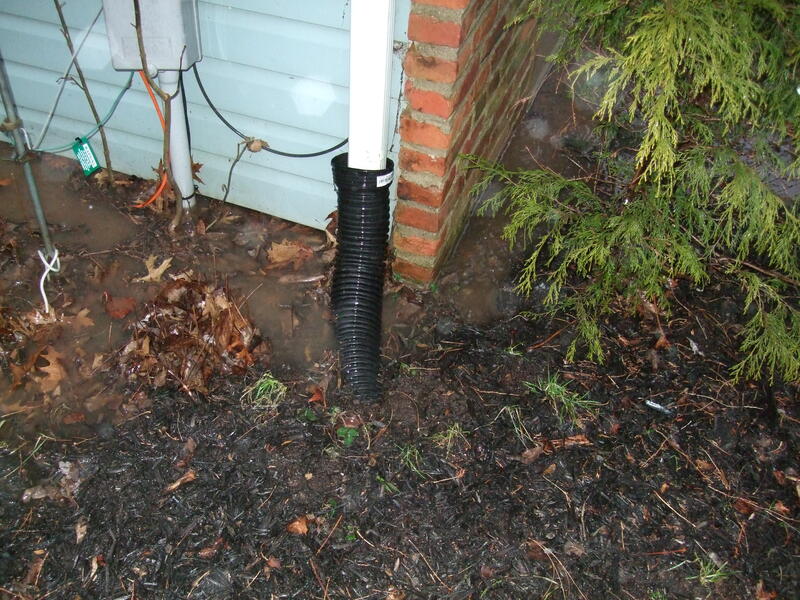 The heavy water flow was being collected by the new drainage inlet system, the slightly raised bed was keeping the water off of the house and directed toward the new drainage system. Chris later returned to see the lawn had dried out soon after the rain was gone. The grass filled in and grew over the new stone in the lawn later that spring.